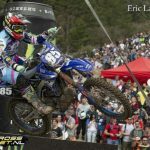 Nancy van der Ven of No Fear Yamaha scored her first WMX podium of the 2018 season at the Portuguese GP. At Agueda, she finished second and fourth in the heats respectively to finish third overall. After a good start in the first heat, Van der Ven immediately slotted into third spot. After passing Larissa Papenmeijer, she set off in pursuit of Courtney Duncan. She came closer, but a mistake undid all of her good work and finished second. Heavy rain on Saturday night made the track muddy and slippery for Sunday’s race. Van der Ven slid out on the start grid but recovered to fifth. She passed Shana van der Vlist to grab fourth, but had to toss her goggles, which made it difficult to get close enough to pass. She eventually finished fourth. There is five weeks time for Van der Ven to recover fully before the next GP in Teutschenthal in five weeks’ time.